Mention the words ‘motorcycle airbag’ and you might receive a funny stare. Perhaps people visualize a giant inflatable balloon projected milli-seconds before incident to cushion your impact. Cars may work this way but on a motorcycle the method is a little different. A motorcycle air bag is slightly misnamed as it’s the rider who carries the bag not the machine. Only a lead connects it to the actual bike. This lead is similar to a kill-chord, the likes of which you’ll find on a jet-ski to cut the throttle and avoid a runaway craft should the rider fall off mid-ocean. The lead on a motorcycle airbag serves a different purpose. It still deploys in the event of the rider being separated from the machine but when the line becomes taught the tension activates a CO2 cartridge built into the jacket which inflates the jacket in just a 1/10th of a second. Watch the video below to see how these things deploy in the real world. 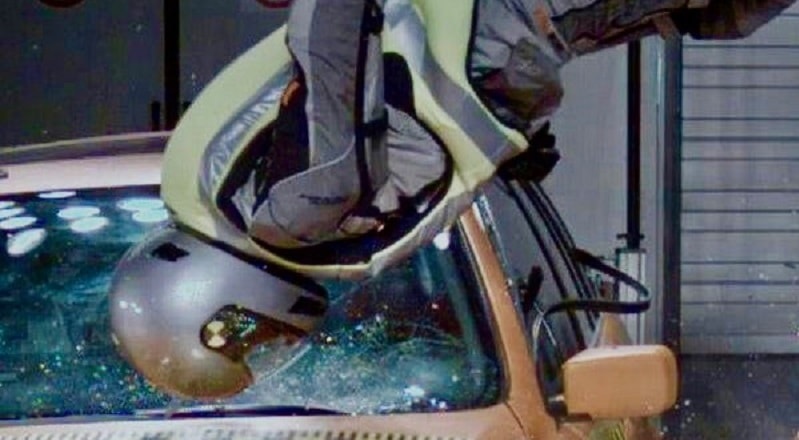 It is important to understand that such jackets are effective in some accident scenarios but not others. Riding into a brick wall (should you feel the need!) will not activate the jacket on time because there is no distance created to put tension on the lead and activate the inflate mechanism. Hitting a car and flying over its roof is much better (can’t wait!) because the rider will very quickly become separated from the machine and the lead will become tight and activate the jacket well before you make an impact, which is of course the whole idea. Now while everybody loves to try out their wonderful new motorcycle accessories such as gloves, GPS devices and heated grips, you’ll just have to take the airbag manufacturer’s word for it that it works. In fact they probably hope you’ll never use it at all. Some come with a limited guarantee although in the event of failure it’s unlikely you’ll be around to get your money back! The motorcycle airbag doesn’t give all-round protection because it can’t. Resembling a life-jacket or scuba diver’s buoyancy control device it only covers the chest and back areas. Your other protective clothing should cover the rest of your body such as the helmet protecting the head and shoulder, gloves, elbow and knee pads doing their job elsewhere. The good news is that once fully inflated, preferably before impact, the rear coverage extends right up to the back of the helmet acting as a temporary neck brace. There is plenty of cushioning all down the back below the pelvis area and the chest too is completely covered. Legs and arms are still vulnerable but the vital organs of the torso are protected. If you’re thinking of using one as a makeshift lifejacket then think again. Once fully inflated the jacket slowly begins to deflate. After a few seconds it’s served its purpose of cushioning against impact. Then it just becomes a hindrance to emergency personnel who may wish to remove it delicately if you’re injured. The good news? Provided it hasn’t been punctured or damaged, is that it’s re-usable. 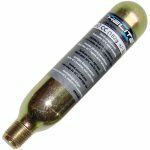 Simply buy a new CO2 cartridge and replace, you’ll be ready and equipped for your next fall! Consider the airbag jacket like a tough-skinned balloon. Stick a pin in it or scrape it against sharp objects and it will lose its ability to inflate. Riders should guard against its exposure to heat, any sharp riding apparel or bike accessories that may cause damage. Air bag jackets have an advantage over protective hard vests in that when not in use they don’t take up as much space. However, the disadvantage is that airbags won’t work in close up or immediate impact events where the rider does not separate from the bike in time. Can airbag vests fire accidentally? Accidental deployment is unlikely given the tension of around 30kg required to activate the inflation mechanism. If you park your bike and walk away forcefully without remembering to disconnect the lead then the consequences are more likely embarrassing than dangerous. Pillion passengers can wear them too by attaching their leads to somewhere solid on the bike. As long as it doesn’t restrict either individual while on the road or become caught in any moving parts then it will deploy as described if needed. Riders may choose to wear an airbag device under or over their regular riding jackets as long as the inflation isn’t restricted. That would be unlikely given the temporary pressure of 1.35kg per square centimeter it exerts when deployed. They’re also less likely to be punctured or damaged during an accident if worn under an existing jacket but you’ll probably have other things to worry about! A rider also has the option of doubling up. Choose an airbag device with a bright fluorescent colour and you also have a high-viz safety jacket. 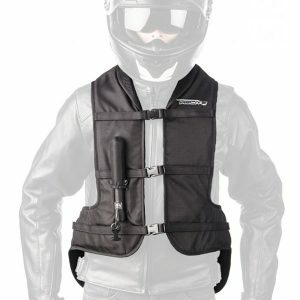 Another option is the integrated jacket – a normal motorcycle jacket with a built-in inflatable airbag device. 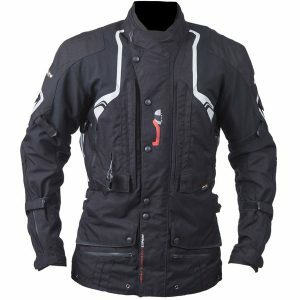 This waterproof touring jacket comes with all the usual insulating and protective features of a high-quality jacket but with the extra advantage of the integrated inflatable air bag device. Given the cost of quality normal jackets and standalone air bags this model may provide a big saving. Quality comes at a price. Expensive compared to most other jackets. The Helite inflatable air vest is… just that – an inflatable vest made of polyester with a PVC coating. It can be worn under or over an existing motorcycle jacket. While its design is pretty simple it gives extensive protection to the back, neck, coccyx, ribs and chest area when fully inflated. Otherwise it sits, low profile and out of the way while you ride. Doesn’t stand out due to dark colour. 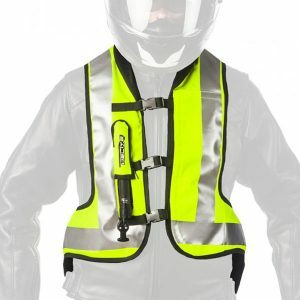 The Helite Turtle Shell air bag is also a high viz jacket in one. Needless to say it’s better worn over an existing jacket. Despite its relatively sparse visible front coverage area it does provide extensive protection to the back, neck, coccyx, ribs and chest. The airbags when bought separately may appear expensive compared to a normal jacket with a similar price tag. However an integrated model avoids duplication and absorbs much of the cost. 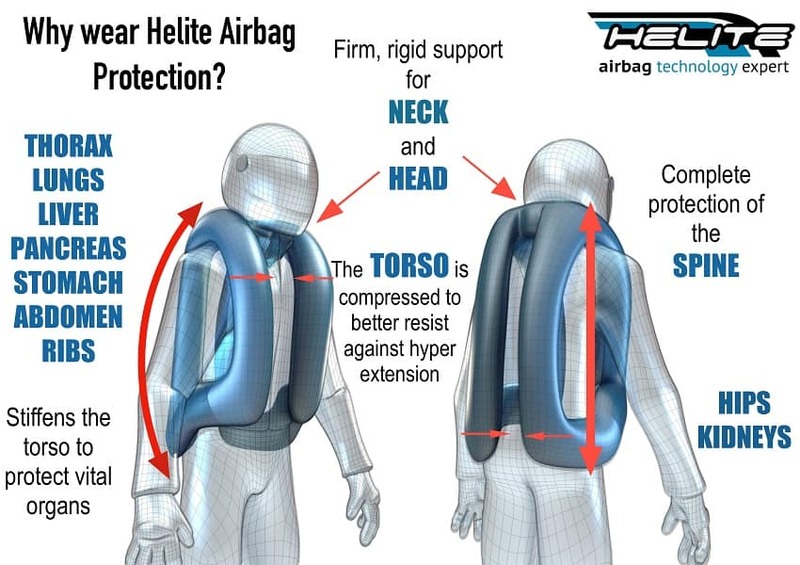 A rider really has to decide whether protecting these vital areas can be achieved by hard amour at a lesser cost or if the separate air bag option is worth the extra expense. Financial reasons not withstanding one is certainly no worse off by having one and if you truly believe they could make the difference between life, death or debilitating injury then perhaps they’re worth considering. Just don’t forget to connect the cord!